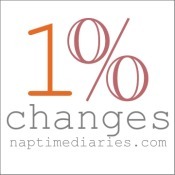 "One percent changes is a new blog project to encourage and connect other women as they make one percent, baby changes, to slowly and surely walk towards a life of healthiness and walk away from unreasonable expectations of ourselves. The idea is, if we're making tiny and yet still costly changes daily (or weekly! or monthly!) that stick, sooner or later we'll find ourselves healthier women - able to live our lives a bit fuller and a lot less focused on how unhealthy we feel." I will read my Bible at least once per day. Not my whole Bible every day (that might be a bit over the top), but at least one little snippet. Every day. Even if it's just one verse. Because I know that the Word of God will brighten my life and make me healthier in so so many ways. So many days I feel tired, worn down, or emotionally exhausted, and opening my Bible sounds like such a chore. But really, isn't a good dose of God's love what I really need in those circumstances?? So starting today, daily Bible reading. My 1% Change.